The American dollar fell against all of its major rivals but the EUR on Monday, as investors struggled to stay positive. The day started with China extending its easing policy further with a general cut in the reserve requirement ratio of 0.5 percentage points, which led to strong declines in Asian stocks. In Europe, the EU inflation data surprised on the downside, as February readings came out at -0.2% compared to a year before, while the core annual reading shrunk to 0.7%. The common currency came under pressure as the market is pricing in a 15bps deposit rate cut in the upcoming ECB meeting, and remained subdued, despite US macro figures disappointed. The Pending Home Sales Index declined 2.5% over the month, falling from December’s upwardly revised reading of 108.7 to a level of 106.0 in January, while the Chicago PMI plummeted to 47.6 from the previous 55.6. The common currency was on its back foot ever since the day started, advancing briefly towards 1.0960 at the London opening before falling to fresh lows at 1.0858. Despite broad dollar's weakness, the pair consolidates near its daily low by the end of the day, maintaining a generally negative technical tone. Short term, the 1 hour chart shows that the price remains below a bearish 20 SMA, while the indicators head south within bearish territory, indicating the risk remains towards the downside. In the 4 hours chart, the technical picture also favors additional declines, although the technical indicators have lost bearish strength around oversold levels. Some consolidation could be expected, with strong buying interest aligned around 1.0810, and large stops below it that if triggered, could see the pair approaching 1.0700 next Tuesday. The Japanese Yen opened the week with a strong footing, helped by falling stocks for most of the first two sessions of the day, although Wall Street trades slightly higher by the end of the day. 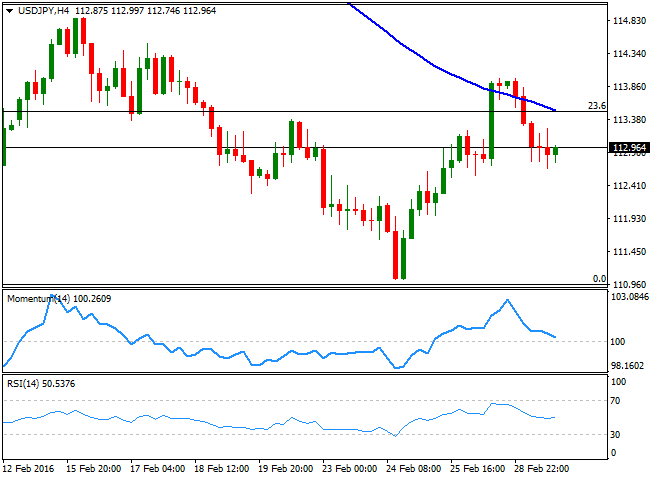 The EUR/JPY pair resumed its slide, also helped by a weaker EUR, and flirted with the low set last week at 122.43, now trading a few pips above it. From a technical point of view, the pair presents a bearish tone, as in the 1 hour chart, the price has extended, and found resistance on an intraday advance, at its 100 SMA, currently at 123.80. In the same chart, the technical indicators have managed to correct from oversold levels, but remain well into negative territory, with no upward strength. In the 4 hours chart, the Momentum heads sharply lower below its 100 level, the RSI indicator hovers around 33, whilst the 100 SMA has accelerated its decline below the 200 SMA far above the current level, supporting some further declines on a break below the mentioned low. The British Pound recovered some ground in the American afternoon, after extending its decline down to 1.3835 against the greenback at the beginning of the American session, a new almost 6-year low. 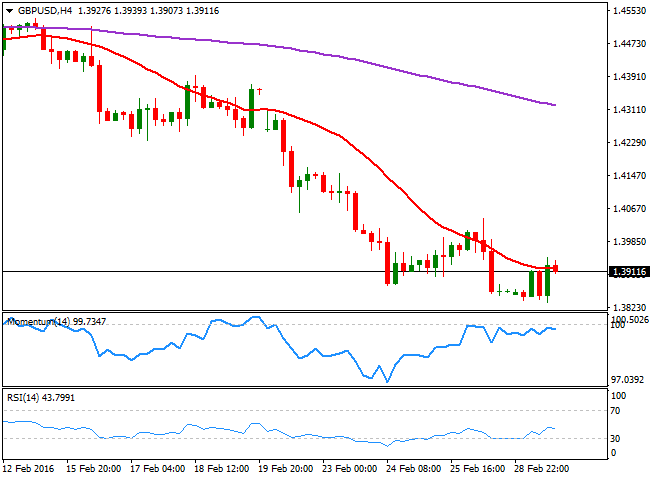 Tepid US housing and manufacturing figures helped the GBP/USD pair to bounce, and even correct the extreme oversold readings seen in the daily chart. But the negative sentiment towards the Pound prevails ever since the announcement of the date of the referendum on whether to stay or not within the EU, and selling interest at higher levels will likely be the way to play the pair. Technically, the 1 hour chart shows that the latest advance has helped the pair to recover above its 20 SMA and the technical indicators extend above their mid-lines, but are currently turning south in positive territory. In the 4 hours chart, the price is unable to advance beyond a horizontal 20 SMA, while the technical indicators lack directional strength below their mid-lines, given no clear clues on what's next for the pair, although the risk is clearly towards the downside. At this point, the price needs to break below the mentioned low to confirm a firmer downward continuation, with a break below the 1.3800 figure exposing the pair to a retest of 1.3501, 2009 low. 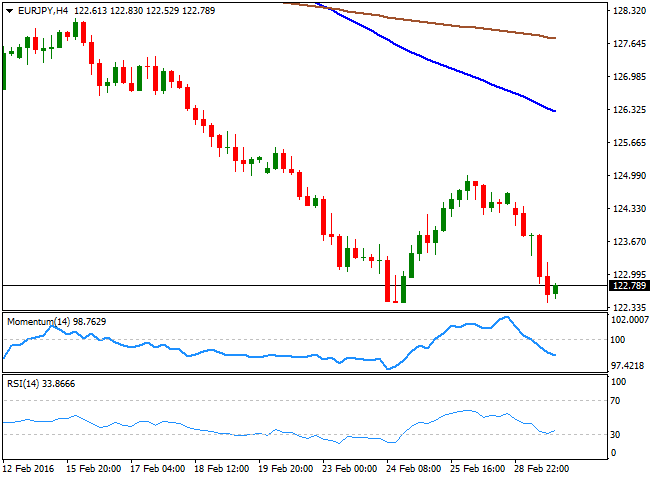 The USD/JPY pair lost around 100 pips from its Friday's close, as the G20 meeting that took place in Shanghai during the weekend, failed to boost market's sentiment. The Group committed to going beyond easy-money monetary policy to pursue structural reforms in their respective countries to strengthen the global economy, but as usual, no actual decision was made. The pair's decline stalled during the American afternoon, as local share markets turned positive, but poor US data maintained the upside limited. From a technical point of view, the 1 hour chart shows that the price is struggling around the 200 SMA, while the 100 SMA heads slightly higher around 112.55, providing an immediate intraday support. In the same chart, the Momentum indicator aims higher, but remains below its 100 level, while the RSI indicator resumed its decline around 43, in line with further declines. 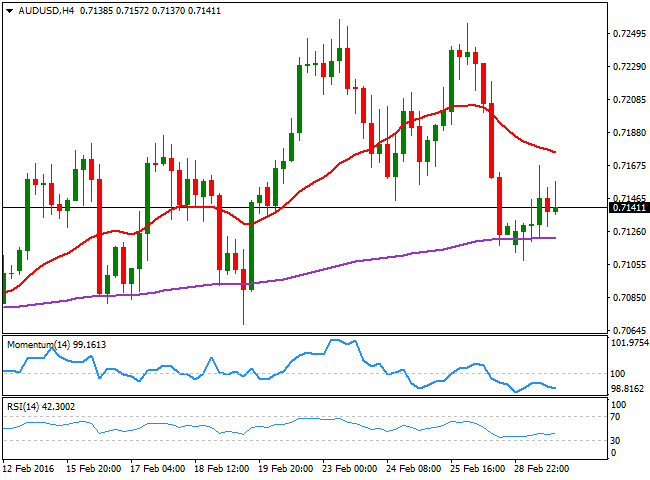 In the 4 hours chart, the price retreated from a bearish 100 SMA, while the Momentum indicator heads south and nears its 100 level, and the RSI stand flat around 50. 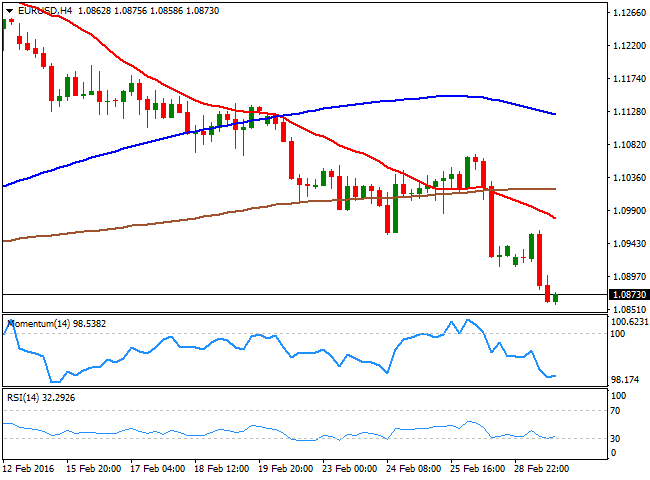 The AUD/USD pair approached the 0.7100 level at the beginning of the day, pressured by poor Australian inflation data. The Melbourne Institute monthly inflation gauge fell by 0.2% in February, after rising by 0.4% in January. In the twelve months to February, the Inflation Gauge increased by 2.1% after a rise of 2.3% for the twelve months to January. The pair however, recovered some ground, although investors have remained side-lined in the Aussie ahead of the upcoming RBA economic policy decision, early Tuesday. The Central Bank is largely expected to remain on hold, with the attention focused in the statement and any clue it could offer on upcoming moves. From a technical point of view, the downward potential seems to be increasing, as in the 1 hour chart, the price stands barely above a mild bullish 20 SMA, whilst the technical indicators turned south around their mid-lines. In the 4 hours chart, the price continues to hold above the 200 EMA, but the technical indicators head south within bearish territory whilst the 20 SMA caps the upside around 0.7185.